HPCL Recruitment 2018: Hindustan Petroleum Corporation Limited has recently released Government Recruitment Notification for Officers, Manager, Engineer etc. Posts. The HPCL published the 155 posts and job required candidates who think that they are eligible for these posts in various departments can apply for HPCL Recruitment 2018. Candidates are invited to fill the HPCL Recruitment 2018 Application Form before the closing date. Candidate can visit the official website for the application process and must complete this process before 31st august 2018. Candidates need to check all details about Recruitment such as eligibility, age limit, selection process etc. from here. Eligible candidates go to the official website HPCL. 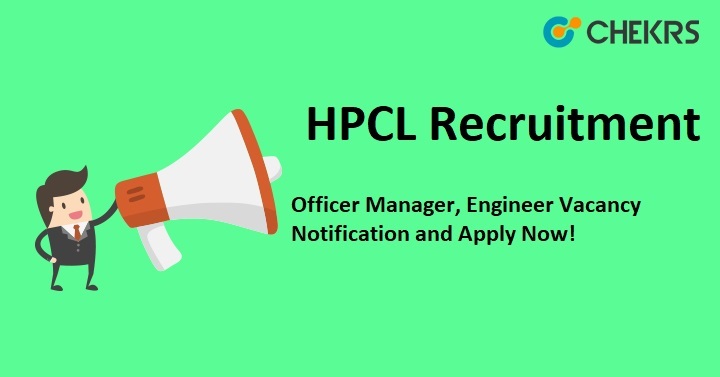 Search the HPCL Recruitment notification and click on it. Click on the Apply Online and fill the application form with all mandatory fields. Remarks: You can get more alerts on HPCL Recruitment 2018 keep in touch our website www.jobs.chekrs.com. In the case of any query or review, your valuable comments are most welcome in the commenting section below and our team will get in touch with you shortly.